In the fall of 2011 we started talking about adding a second dog to our family (we had one Shih Tzu). We were thinking of another smaller dog but saw a photo of DAISY (a yellow lab/great pyrenees mix) in the Beachcomber. We called about her and were very disappointed to hear that she had already been adopted. A couple weeks later we received a call about another dog up for adoption. We thought about it but decided that we were still a little sad about not getting Daisy. The woman who called us said, “Daisy? The lab/pyrenees mix? She has been turned back in”. Turned back? Uh-oh, that didn’t sound good! We decided to meet her anyway and went to the foster home to meet her. She proceeded to jump right into our car so we decided we would take her home for a visit. She never left! That isn’t to say it has always been easy! During the first few weeks she chewed up several things (including a sofa! ), growled whenever another pet went near her food dish and was a little aggressive on her leash around other dogs. All of these things were easily managed with some training (thank you Janet Miller! ), a crate for when we are gone, and feeding her in her own space. She is a fabulous part of our family! As it also turns out, she loves playing with other dogs and is not aggressive at all toward them. She just had not spent much time around other dogs until she started going to doggy day care! 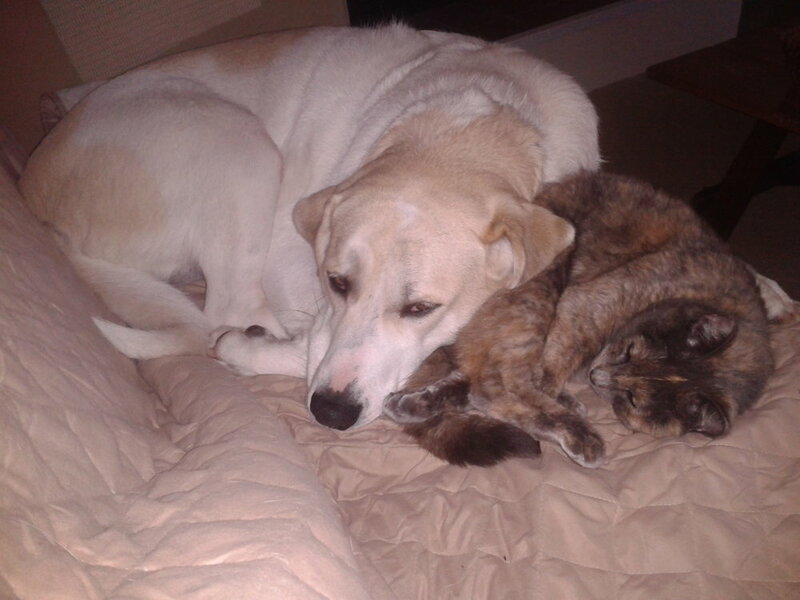 She is extremely gentle with our cat (who loves to cuddle with Daisy!) and will tease our little dog, Roxy, until Roxy finally gives in to chase Daisy around the yard (which is what she was trying to achieve anyway!). We are so lucky to now have Daisy as part of our family! I would advise anyone to adopt a rescue dog and just to be patient, loving and get advice if needed. Sometimes all these dogs need is to know that they have a stable home and no one is giving up on them….even when they eat the sofa!